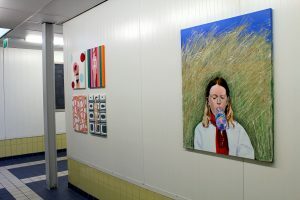 Together with curator Siebe Hansma I selected over 40 paintings from 2002 till 2016 for a solo exhibition in the corridors of Ten Kate Vetten BV., Ter Apelkanaal. Ten Kate is one of the largest producers of high-quality animal fats and proteins in Europe with a worldwide export. 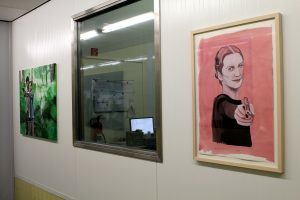 The location is not a ‘White Cube’ but an industrial environment: walls with lemon yellow tiles and white sheet piling, cool fluorescent lighting and the production process can be followed through the windows. KUNSTINGANG is organized for the staff and the many guests who come to see the innovative production methods. This unusual but challenging stage is an invitation for artists from The Netherlands and abroad to present their work in a professional environment or to create site-specific work. 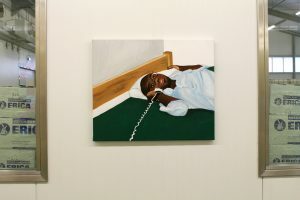 Only after making an appointment, the exhibition can be visited at other times.